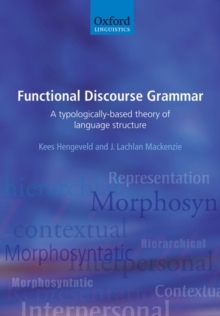 This book is the first comprehensive presentation of Functional Discourse Grammar, a new and important theory of language structure. The authors set out its nature and origins and show how it relates to contemporary linguistic theory. They demonstrate and test its explanatory power and descriptive utility against linguistic facts from over 150 languages across a wide range of linguistic families. After a full introduction the book is divided into chapters concerned with the four levels of grammatical representation - pragmatic, semantic, morphosyntactic, and phonological - each of which has its own hierarchical structure. Functional Discourse Grammar offers a thorough account of how the use and meaning of language influence linguistic form by conditioning two levels of formulation which feed into two levels of encoding, all with their own specific characteristics. The book offers anideal introduction to the theory and its applications in typology and description for scholars in linguistics and related fields from graduate students upwards.